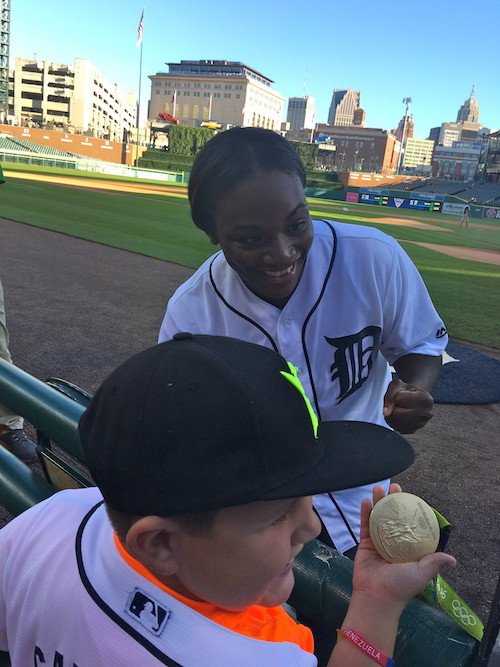 Lance Martinez from My Detroit Sports sends along this original photo of Flint, Michigan native/two-time Olympic Gold Medal winning boxer Claressa Shields meeting fans at Comerica Park in Detroit. Later that evening, Shields threw out the first pitch before the Tigers home game against the Twins. Last month, Shields won a middleweight boxing gold medal at the 2016 Rio Summer Olympics. Back in 2012, Shields won gold in the very same event at the London games. The 21-year-old owns a 77-1 career record, with a résumé that also features two gold medals in the World Championships and one gold when competing in the Pan American Games.